Located just southeast for downtown Henderson, Nevada is Black Mountain Estates, home to a few dozen Palmer & Krisel-designed homes. 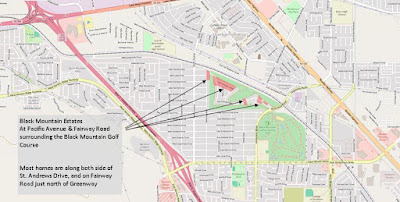 Built by Paradise Homes in 1964, Black Mountain Estates was a first for Henderson – offering the first luxury home community and golf course in the town. Halted by a local recession in 1965 with only a handful of homes constructed, many of the lots were sold individually, resulting in an eclectic neighborhood mix of custom homes from the 70’s, 80’s and 90’s. Henderson has long considered a ‘new’ home community, and accordingly most of the Henderson Palmer & Krisel-designed homes have been renovated and updated beyond recognition to keep pace with the newness of the community. Many have had their entire street side facades reconstructed, eliminating any trace of modernism. To visit Black Mountain Estates, take US 95/I-515 to Horizon Road. From Horizon, head north on Pacific Avenue to Fairway Road, then head east on Fairway Road into Black Mountain Estates. We even added a second floor!